This morning I took off early to get to see Osaka Castle inside and to take some video of the Japanese Waxwings that have been hanging around outside the keep of the castle. I took 2 subways to the castle and when I got there, the Japanese Waxwings were being photographed by the hordes of bird photographers. There must have been more than a couple of dozen bird photographers snapping away. I found out what the Japanese names for the birds were and then did an internet search to find the English names for them. The Japanese names were Hirenjaku and Mahiwa. I still have to edit the video yet, so that will be next post. (Edit) I have finally finished the video and uploaded it so here it is very late. I then went into the castle and had a look at the exhibits. 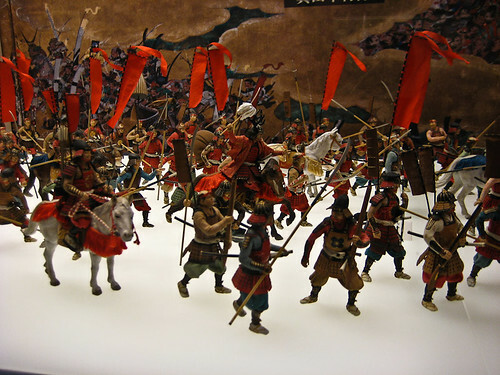 I liked these little action figures of the Battle of Osaka. I think it was about the 17th century. There was also some very interesting newspapers from a couple of hundred years ago. They were printed from wood blocks and I cannot begin to imagine how difficult it would be to carve out Japanese script in a mirror image. Oh, maybe they used a mirror. doh! This is the view from the top of the Osaka Castle. Pretty impressive and ironic as it looks out over the modern city. After that I took the subway to Umeda and had a look around but there was not much there, it is just a huge terminal for trains, subways and buses. So, next post I will hopefully have the bird videos edited up and ready to go. 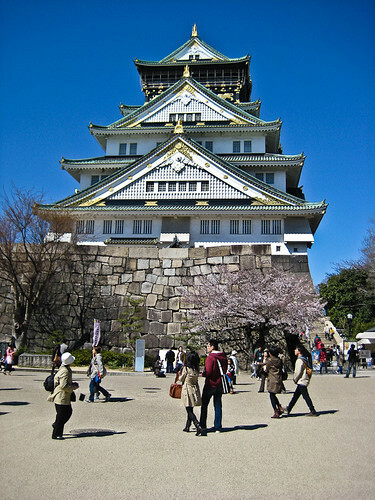 Today my mission was to get to Osaka-jo, Osaka Castle. I walked up towards Nipponbashi and then turned right at Honmachi and walked another couple of kilometers until I got to the museum where there was this structure pictured below. 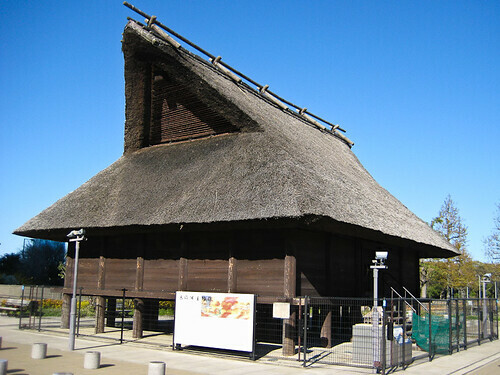 The Hoenzaka Warehouses were built about the last half of the fifth Century. They were large elevated warehouses, having the characteristic multiple supporting posts and “Irimoya” roofing style. 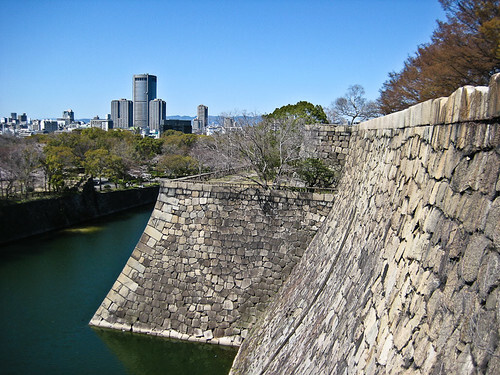 I then continued on over the road to the Osaka Castle surrounds. It has a magnificent moat. I would have hated to have been part of an army charged with the task of storming this castle. I can picture the ninjas sneaking in after midnight, though. 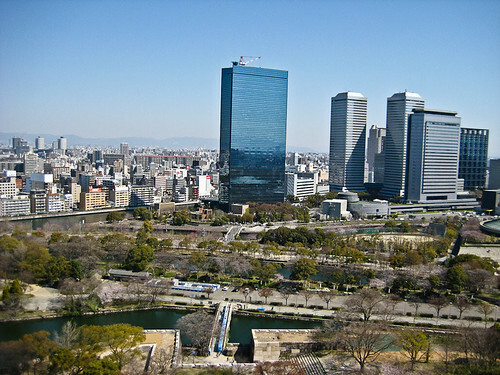 The current tower of Osaka Castle is the third one since the Toyotomi and Tokugawa periods. The present structure was restored by the mayor of Osaka during the Showa period. There were many other people there taking the exact same photo as this one. There were a few couples getting their photos taken in traditional costume. I still do not know what it is all about but I promise to find out before I leave. 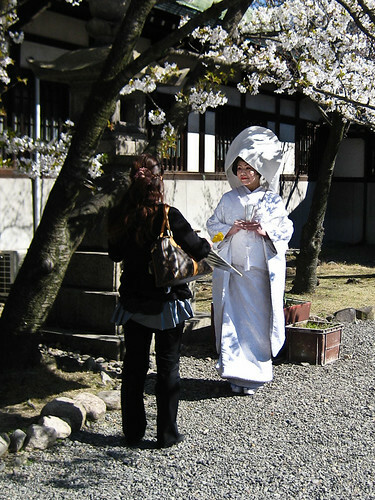 The bloke was standing off to the side having a durry and looking very bored in his kimono. I met a few fellow bird photographers on the way out and they were getting some great shots of some birds in the cherry blossoms. I tried to ask what the names of the birds were but I could not quite make out what they were saying. Cue an internet search. brb. I think they were Eurasian Siskin and maybe something like a grosbeak or a bullfinch. Anyway, on with the show. 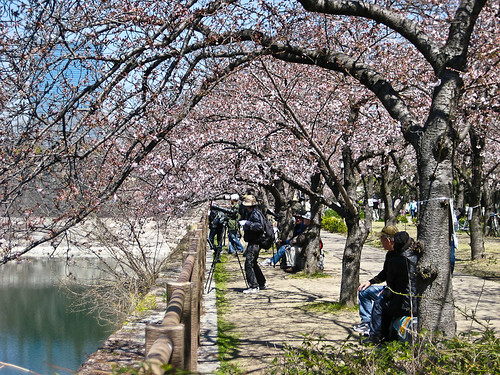 This next photo is of a typical past-time when the Cherry blossoms bloom (Sakura). 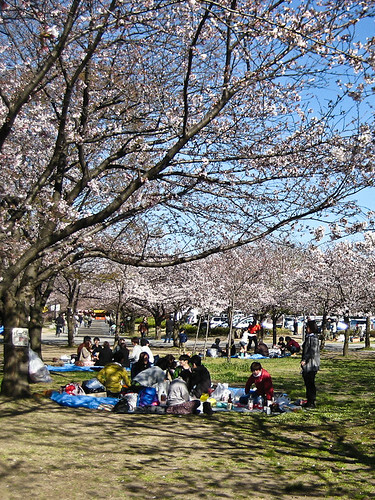 It is called Hanami and consists of sitting under the cherry blossoms and drinking sake and having a picnic. 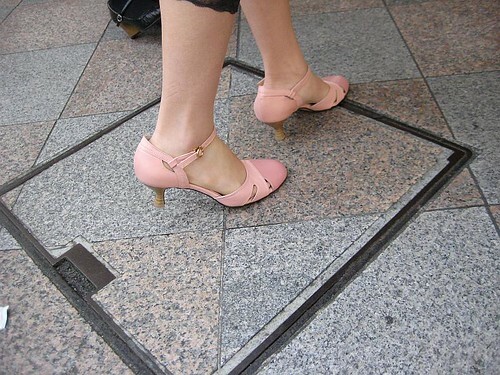 It is a tradition in Japan. This morning I took off from Nara and caught the train to Osaka. Again, a kindly lady helped me cope with the complexities of Japanese trains. But it was really easy. I just got off at Shin-Imamiya Station and walked down the street to find my hotel. Osaka is very different to Kyoto. It seems more working class and grungy. 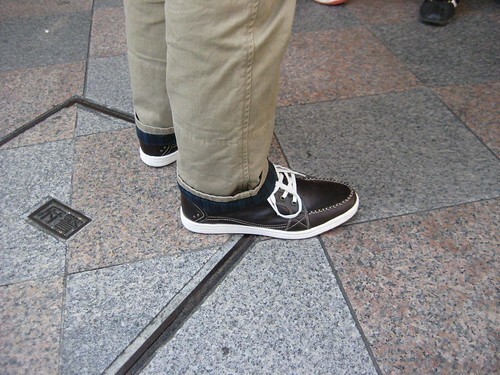 Kyoto is reputed to be more refined and cultured. 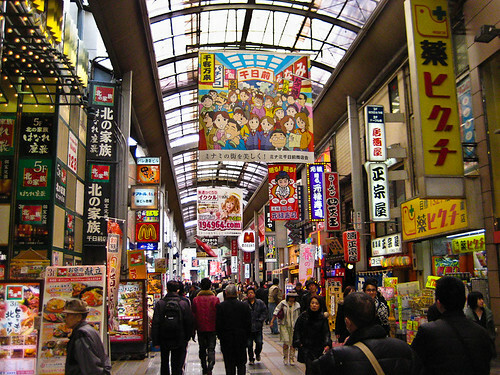 I dumped my bags off at the Hotel and went for a walk to Den Den town, which is the electronic shops location in Osaka. It was not very good. The prices were not cheap and there was not much variety. 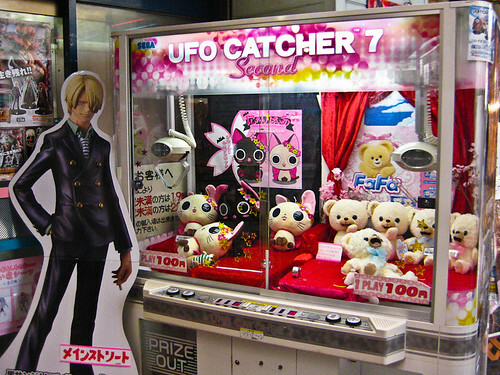 There are heaps of these shops where girls go in and use cranes to pick up a fluffy toy. They are really into “cute”. 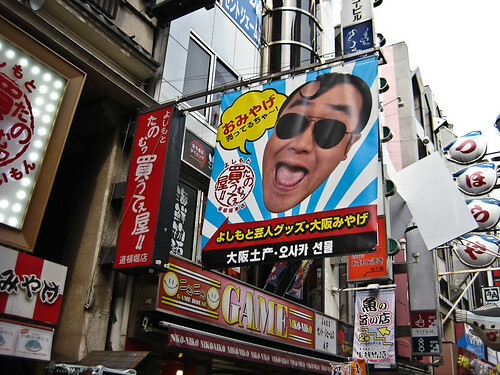 Further up, I found the Namba district which has heaps of shops that have very in your face advertising methods. The colours for the graphics and advertisements are very vivid and colourful. The spruikers are yelling out to come and buy their stuff and they have people with signs directing shoppers to their stores. It is sell, sell, sell. 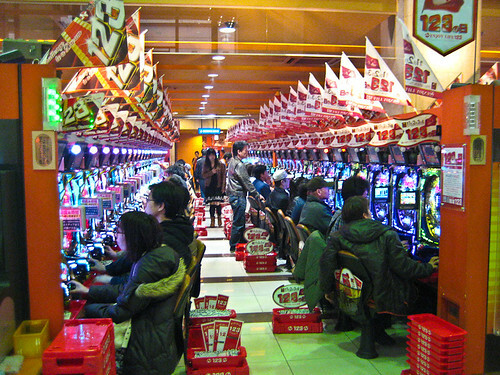 Everywhere you go in Japan, there are Pachinko parlours. I finally worked up the courage to go into one and take a photo and some video. The noise is unbelievable. Watch the video further down the page to get the full effect. 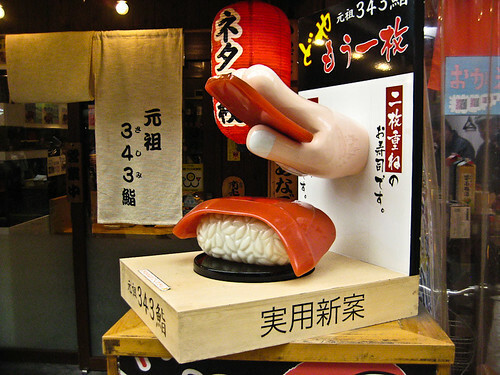 Sashimi on a rice ball is a very common feed here in Japan. You can buy it in a bento box from the supermarket as well. I tried Sashimi once but did not like it. I prefer my fish cooked. Nearly all the young people have all these trinkets and cute fluffy little toys hanging off chains from their pockets or their backpacks. I do not understand it. But I am not really interested in cute “things”. 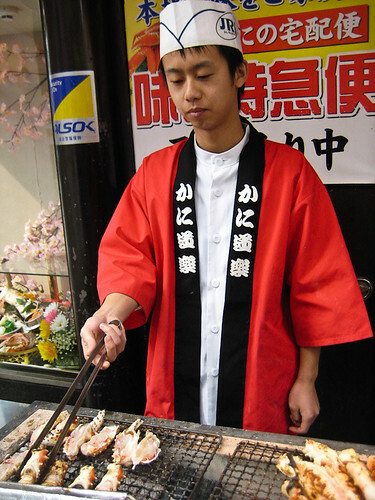 This guy was cooking Spider Crab. They had a huge spider crab above the shop. Another example of some direct advertising to catch your attention. It worked on me. The only problem was I did not have a clue what he was selling. I went into a Pachinko Parlour and filmed it to convey the noise of the place. I also filmed some politician dude walking around town and some other crazy things. 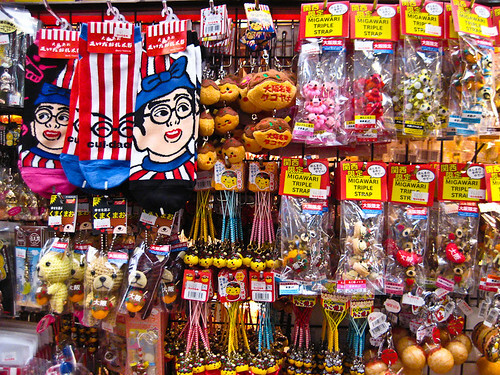 Video shows the extreme nature of the assault on the senses that is a Japanese city. 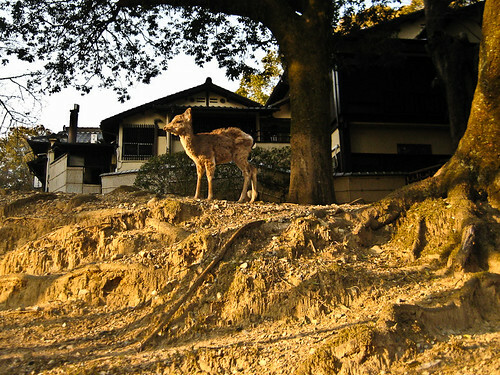 It is very easy to get to Nara from Kyoto. I just took the bus to Kyoto Station and asked Tourist Information how to do it! They held my hand through the whole process and almost put me on the train. A really nice lady even told me to get off a few stops later and catch the express. Nara is a lot smaller than Kyoto so it is not such a mad, bustling city. There are lots of old temples and ponds. In the parks the deer wander around freely and people feed them even though they are not supposed to. 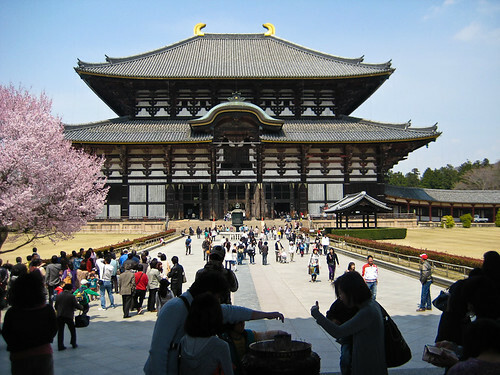 Nara Park has many world heritage listed sites such as Kofukuji Temple, Todaiji Temple and Kasuga Taisha. 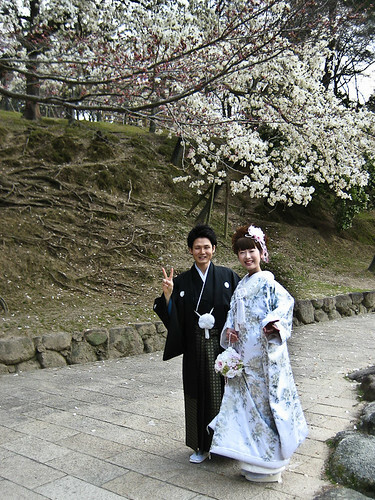 The cherry blossoms are coming out and this lovely couple was having their photos taken in traditional costume. I am not sure if they were getting married or not but they looked very nice indeed. There is a very old five storey pagoda and this massive Buddha temple which was completed in 752 but burnt down twice. This one was built in 1709 and is the largest wooden structure in the world. While I was there I managed to video some birds. The Oriental Turtle Dove was filmed in Kyoto. The highlights of the birds in Nara were the Spot-billed Ducks, the White Wagtail, and the Little Ringed Plover. I did take some video of the turtles in the pond, but since found out that they are feral animals – Red-eared Slider Turtles (Trachemys scripta elegans). They are commonly kept as pets and in Australia they are banned because they can get to be such a pest. I stayed in this fantastic traditional Japanese Guest House in Nara with sliding panel doors and tatami mats. It was so cool. Red-eared Slider Turtle (Trachemys scripta elegans) feral. What can I say about this post. It is art. the end.